Part of the allure of a canoe trip is the bond. Nothing brings people together like shared experiences — and with canoe trips, the experience is all-encompassing. Breaking free from separate day-to-day existences and embracing the collective in the pursuit of adventure can only be about connection; connection with nature, connection with each other. If you’re lucky, these connections strengthen your most important relationships. 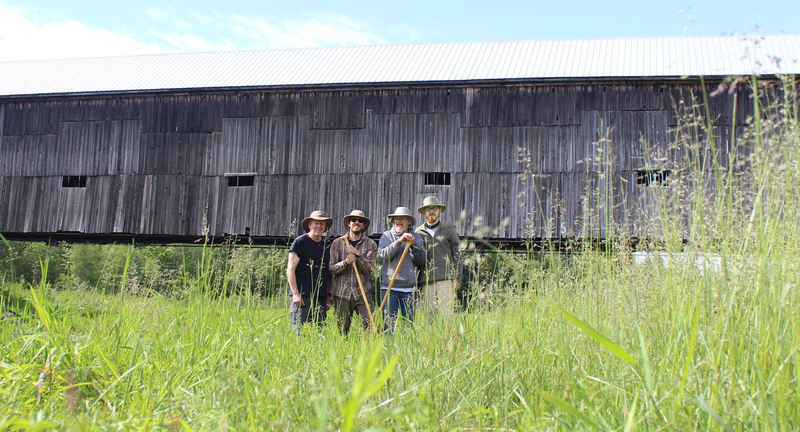 Last June, my father and uncle traveled to New Brunswick to connect with my brother and I. I’d been begging the old farts to come canoeing in New Brunswick for years. Both had long-since retired from tripping, so when they finally relented, there were some terms. 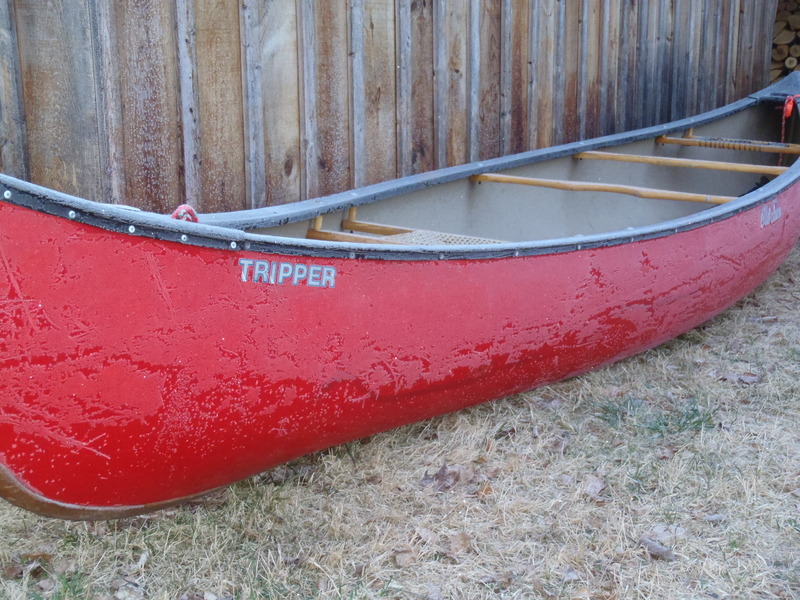 No portaging, minimal rapids, and plenty of brook trout. 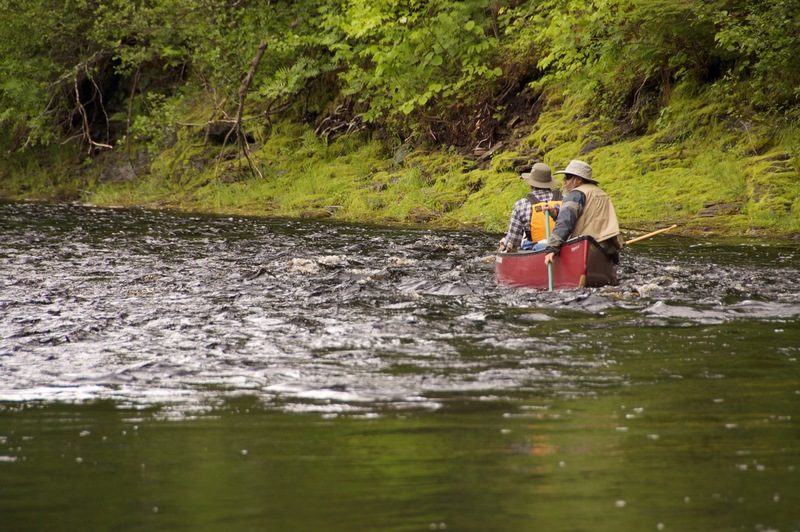 Our destination was the first river I canoe every spring: the Gaspereau. The Gaspereau River begins in earnest in Gaspereau Lake, a small lake that rises from the wetlands of the Bantalor Region in central NB. 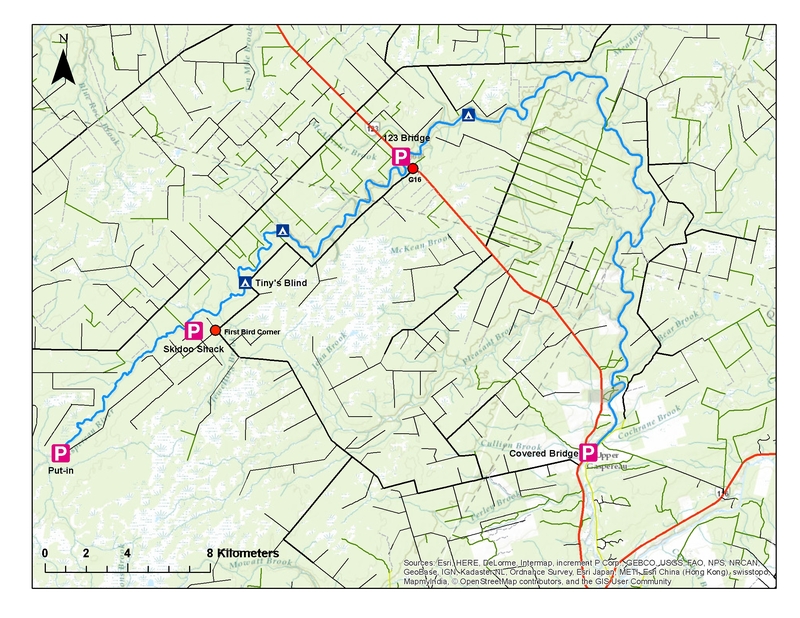 The Gaspereau is a part of the St. John River watershed and runs about 60 km in total — traveling northeast for 35 km or so before turning southward, where it eventually merges with the Salmon River. In a time before roads, the Gaspereau served as an important travel corridor between the St. John and Miramichi River systems. 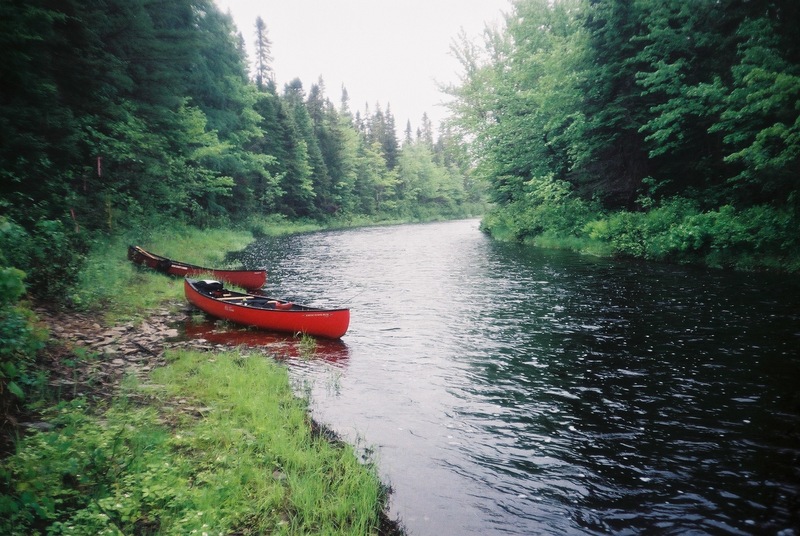 Travelers coming from Saint John would cross a grueling, 8km portage trail to access the Cains River, a tributary of the SW Miramichi. Incredibly, the trail can still be used today thanks to the efforts of W.F. Ganong in the early 1900s and more recently an Ancient Portage Trails Committee. We pulled off Route 123 and onto a logging road on a cool, rainy, mid-June morning. Our plan was to put in at a snowmobile warming hut on the upper Gaspereau and paddle down to the Burpee Covered Bridge. Given the timing of the trip, water levels were a concern. Locals tell me that — when looking down river from 123 bridge — if a large rock is not visible on the last corner before the river goes out of view, then there’s enough for the run. No rocks were visible, so we were feeling confident. The upper Gaspereau flows through a narrow, well-defined channel. Dark, fast moving water flows between banks lined with thick grass and low-lying forest. 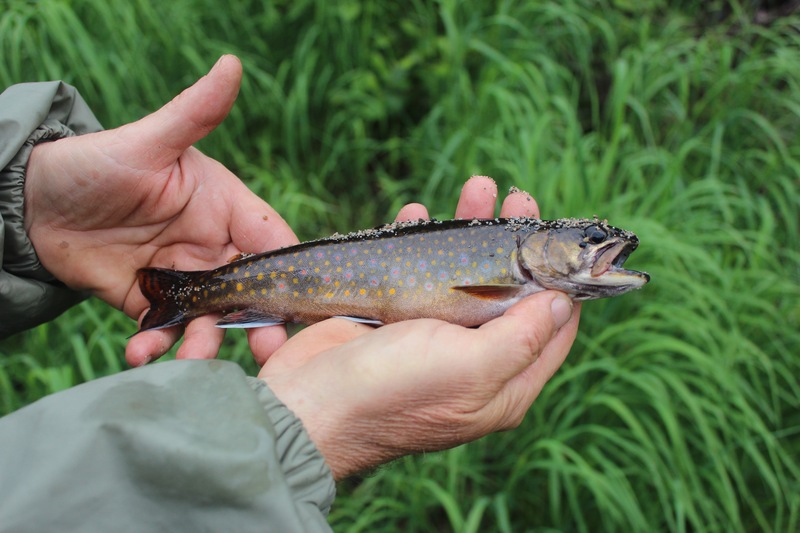 In June, the river is home to a healthy population of brook trout. Within a few minutes of launching, we’d all caught our first trout. Within an hour, each of us could have easily been at our limit for the day. 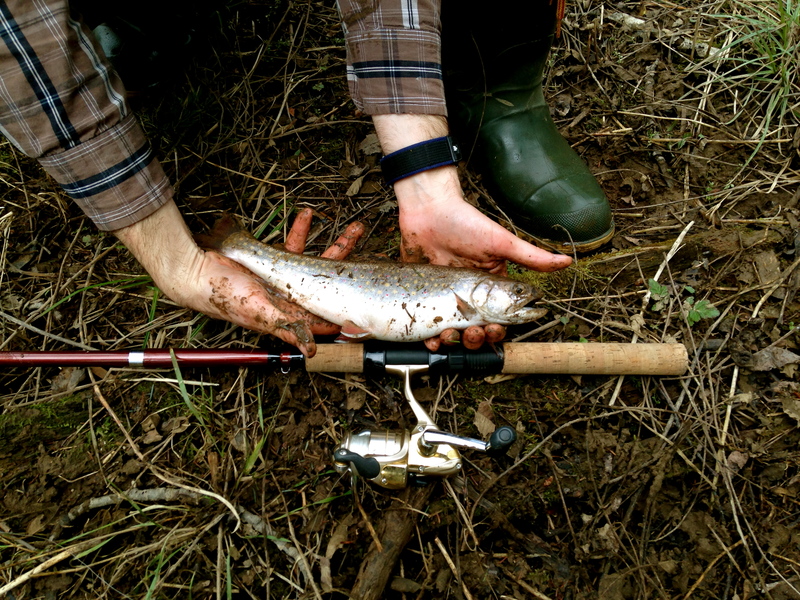 The trout were small, in the 6-9″ range, but beautifully colored. 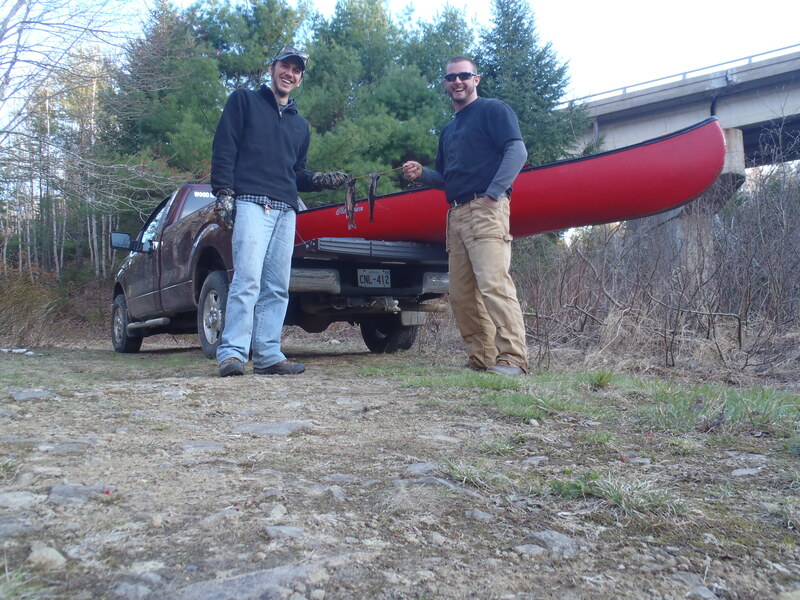 With good fishing and heavy rainfall, our desire to paddle was limited. After a couple hours on the water, and only 3-4km traveled, we started looking for a campsite. Accessing the shore proved to be a saturating experience — 30-40mm of rain will do that. Enormous water droplets sat precariously on the fat blades of grass, waiting for a fool in a cheap rain suit to give them the gift of inertia. Ultimately, we ended up on a long, flat access trail. We erected a fire pit, poured ourselves some Five-Star whiskey, and debated the best lines from our pre-departure movie, “The Edge” with Anthony Hopkins and Alec Baldwin. For your information, “most people lost in the woods, they die of shame” and “fire from ice“ were the two favourites. The next day, as the rain continued to fall, my father and uncle reminisced about their tripping histories. 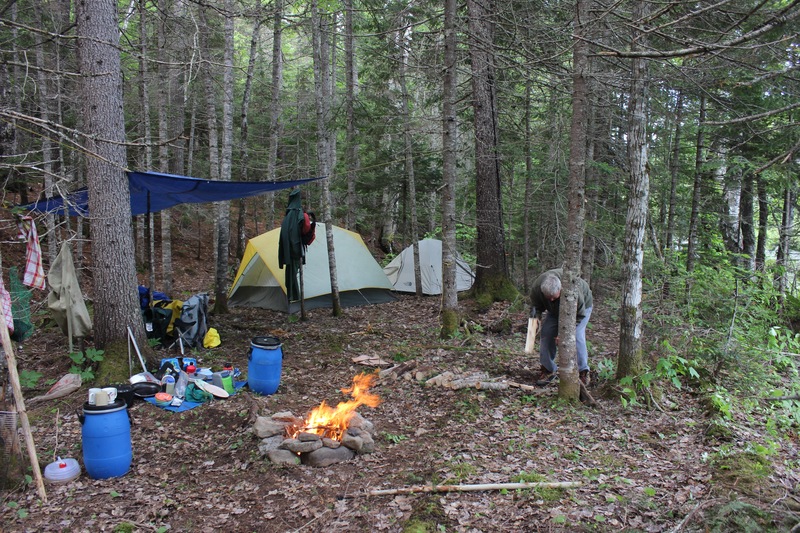 They reminded my brother and I that foul weather builds character, and that camping gear has improved substantially over the last 40-years — no doubt in their day, they portaged uphill both ways. It was fun to watch them fall back into their old routine — the food manager, the chef, the wood collector..etc. In observing their systematic behaviour I had the realization that you can learn a lot from old guys. Again, the fishing was excellent, so we spent our time casting rather than paddling. 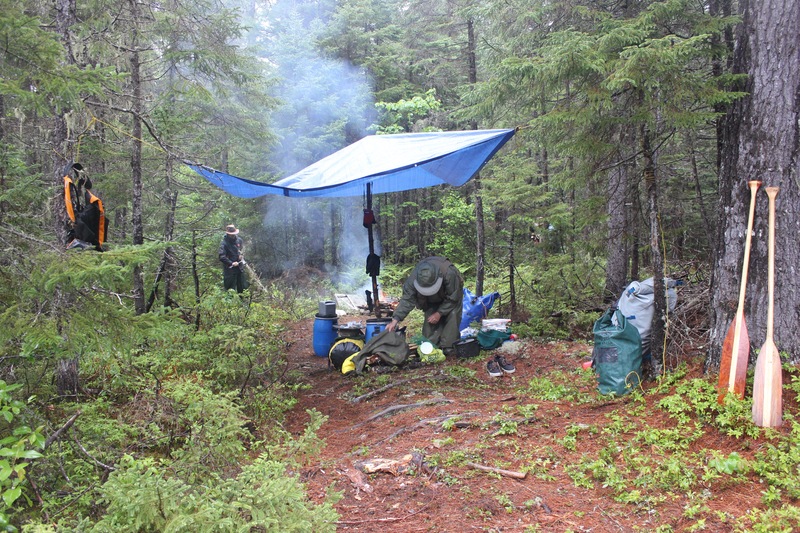 We only traveled another few kilometers before deciding to set up camp. Our second site was on a shrubby point off the sharp corner just below the mouth of Mountain Brook. 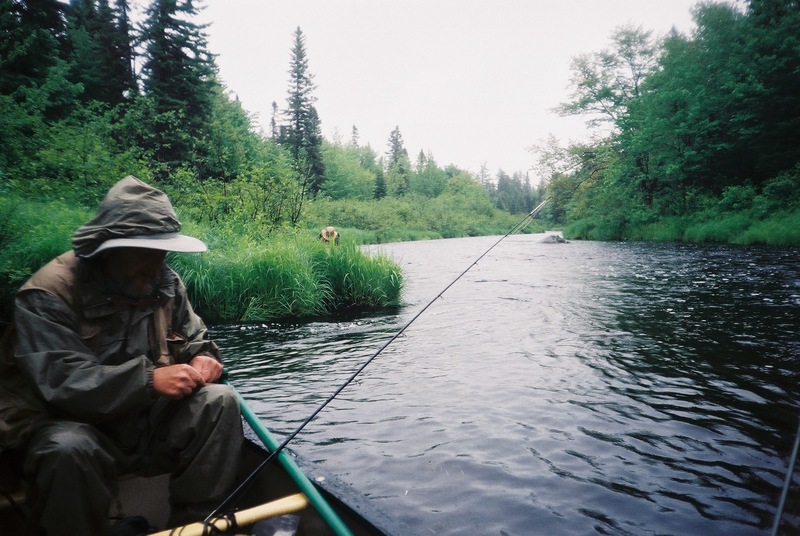 The river slowed as it rounded the bend and formed a deep pool that was full of trout. The sun finally emerged late that evening. Low angled light glazed the tree tops with a golden hue during the evening fishing session, a hopeful sign for things to come. My father — the grill master — looking on as he tended the cooking fire, noted that “you kids don’t have the experience to cook a perfect steak in the woods.” He was not wrong. 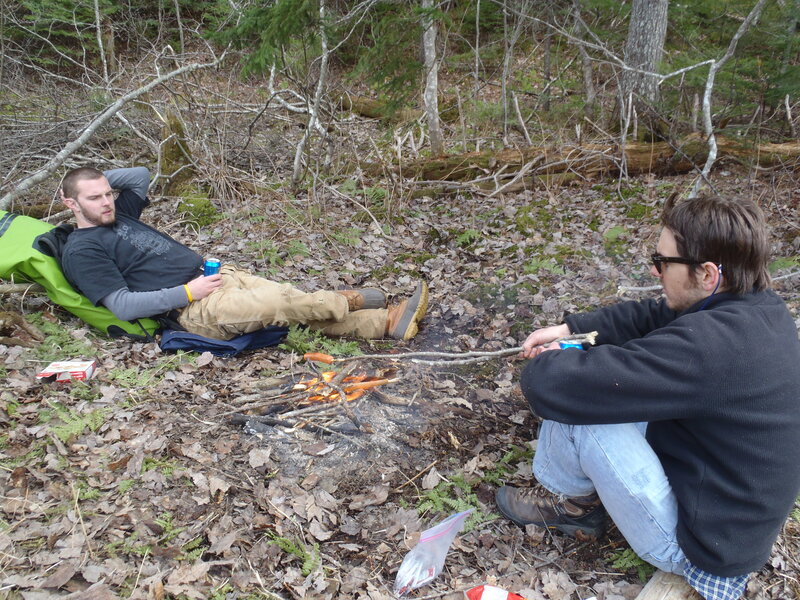 Later, we assembled around the campfire under a star lit sky and told stories of trips gone by — my brother and I struggling to imagine our elders as youths. 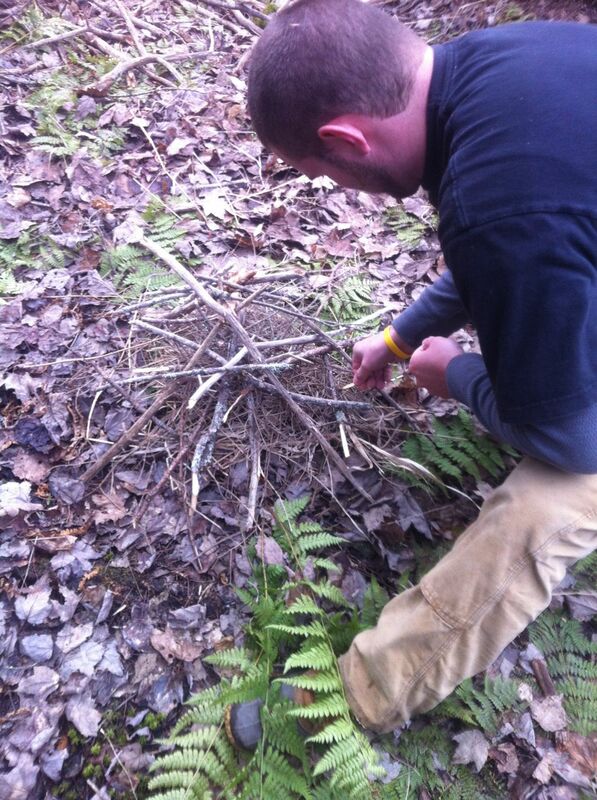 After a couple whiskies and some campfire pizzas, we turned in. The sun warmed our faces on day three as we finally paddled under the Route 123 bridge — a common nighthawk swooped to within a few feet of us on the other side. After this point, the Gaspereau widens out, becoming rocky and shallow. We realized that, without the previous two days’ rain, the trip may not even have been possible. The fishing action quieted down, but we still managed to enjoy a shore lunch. Eventually, we picked our way down river a kilometer or so and settled on our final campsite. The site was nestled under some mature fir and spruce trees, elevated enough to be dry, with lady slippers dotting the understory. After an hour’s work, it was a great site with a nice fire pit and plenty of wood storage. We spent our last evening together enjoying each others’ company. On our final morning, the sun was shining and the birds were chirping early. Inside my two-man tent, I opened my eyes to my brothers’ bloodshot stare, he mouthed, “The f-ing birds” — clearly sleep had eluded him. My father and uncle had the coffee percolating on the fire when we finally emerged. We pulled our stools up to the fire, poured ourselves a mug and sat together, enjoying a still moment watching the river flow by. Here in New Brunswick, we’re lucky to have wild rivers right on our doorstep. Personally, I feel lucky to have people to share them with. On the final day of the trip we scrapped our way down 25 or so kilometers of river finally arriving at the covered bridge; a structure standing the test of time, like the bonds created by those who travel the waters flowing underneath. As the winter draws to an end and the days begin to warm, I start to see signs that the rivers will soon begin to flow. As an avid canoeist and fisherman, spring break-up brings all the memories of seasons past and the anticipation of memories to be made. 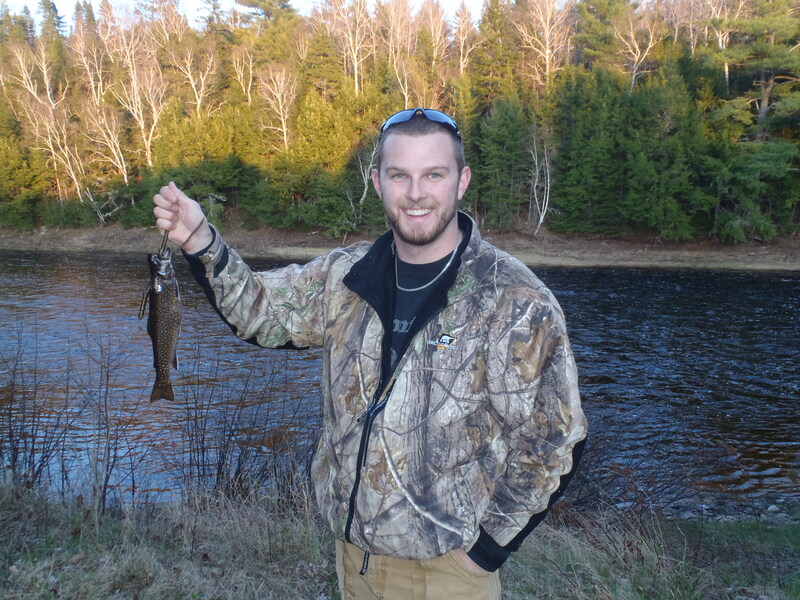 I recall an early season trip back in April 2012, Grant and I were anxious to get the first trip of the year under our belts and to try our luck with the early-run trout. 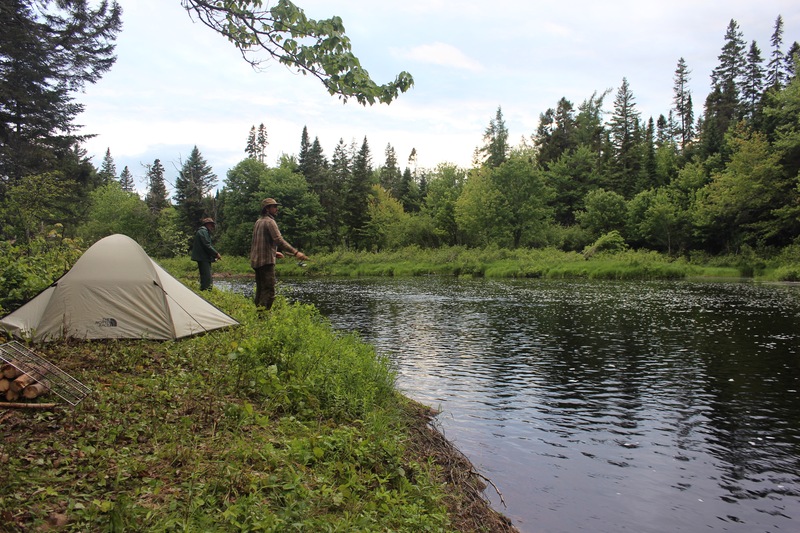 We convened on a Friday evening at the camp with the goal of doing a little stream-hopping — trying a few casts in a couple different nearby tributaries of the Gaspereau River — and getting up early Saturday for an upper Gaspereau River paddling adventure. McKean Brook was our first destination. To get there we headed north on Route 123 towards Doaktown, and pulled onto a logging road known locally as G-11. The brook meanders east, draining Ackerman Heath, and is known to hold trout in the early season. It crosses G-11 at an 8 foot galvanized-steel pipe — where we parked the truck and baited some hooks. We worked a few hundred meters of stream on both sides of the pipe, but with high water levels and a subconscious knowledge that it was probably TOO early for trout, we decided to pack up and try another stream. We headed further north, crossing the Gaspereau River Bridge — our take out the next day – turning onto Mountain Brook Road to try our luck on a brook of the same name. Mountain Brook flows northeast into the Cains River. We stopped at a bottomless arch culvert and worked a few casts into the black water. Again, no luck. Determined to catch something, the right decision seemed to be to head back to camp in hopes that some of last season’s trout were trapped in the beaver pond behind the camp. After a few casts we started to think that leaving the fishing rods behind tomorrow wouldn’t be a terrible idea, when I felt a light nudge at my single blade spinner. A quick retrieve and an aggressive cast back to the same location yielded an instant strike. The fish squirmed and ran parallel to the dam before breaking the surface in a series of splashes while I reeled her towards shore. 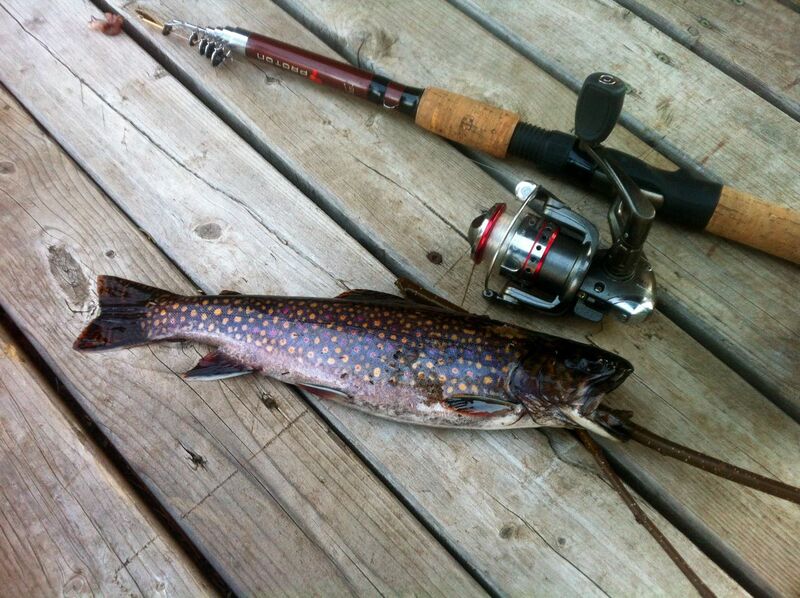 It was a beautifully colored brook trout that had darkened from overwintering in the beaver pond. It retained pink coloration in its meat — which paired nicely with our strip loin steaks later that evening. A few cold pops enjoyed over several games of cribbage next to the fireplace saw us into our respective beds. Camo keeps me hidden from trout too! Grant and I arose to a chilly cabin and a silvery landscape. A heavy frost had worked its way into the river valley overnight. Over breakfast we both agreed that this is what spring paddling is all about. After shuttling a truck to the bridge we headed to our put in. 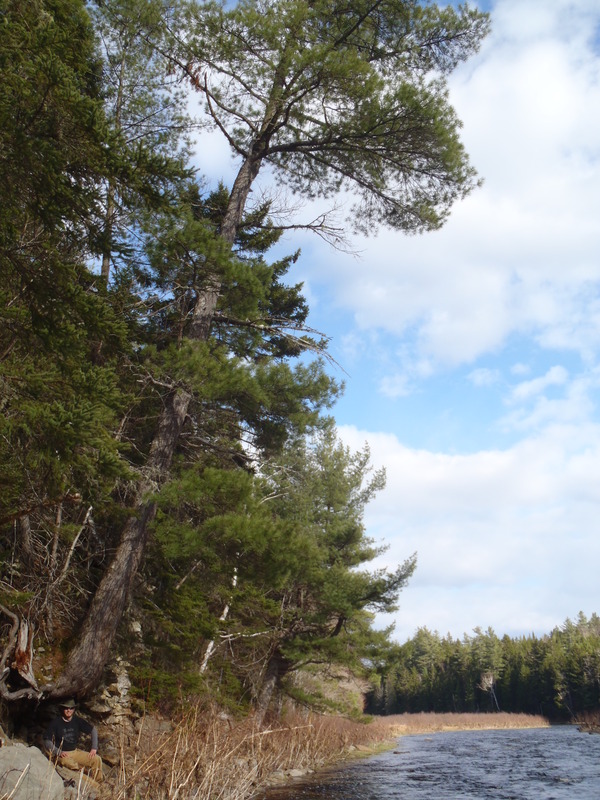 From here it was a short portage to the river’s edge where, as the sun began to peer over the tree tops, we slid the Old Town Tripper into the water. We had roughly 15km ahead of us to the bridge, an easy day paddle with plenty of time for fishing at the best holes. The water was swift and made paddling more of a steering affair – I’m not sure Grant touched a paddle all day. Steering is important on this stretch of the Gaspereau River, it is narrow and turns back to meet itself every kilometer or so. Out of the sunlight the air was cool and most of the trip was through the shadows of the mature spruce and pine. We managed to keep warm by doing the odd 8oz curl and casting our lines. As lunch time rolled around we spotted a nice bank with a few downed snags and pulled ashore. We worked swiftly to get a little fire going to take the chill off. 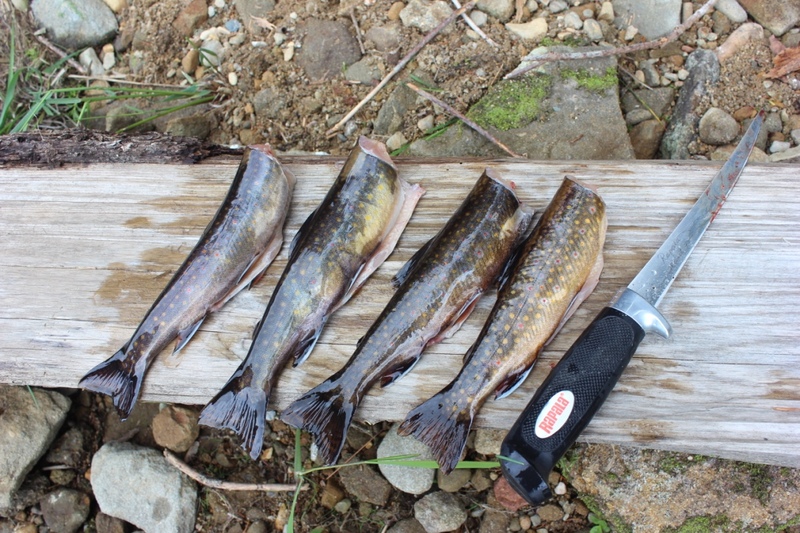 Thankfully we had brought hotdogs and granola bars along with us as the fish were hiding quite well up here too. After our shore lunch we continued on down river enjoying the scenery and the day as it was presented to us. Small talk and sightseeing was all that was needed for entertainment. We landed an 8 inch winter trout each before happening upon a majestic pine that the ice had scoured under for years, giving it appearance of being suspended in the fresh spring air. Effortless paddle strokes brought us around the bends until finally, the bridge was in sight. Bring on the effortless bends.